His book analyzes the root cause of dejection. Unless the cause is ascertained, no remedy can be sought. Everyone faces an identity crisis at some point in his/her life as a result of which one's priorities become misplaced. Thus all our endeavors meet with dejection sooner or later. Dejection can become a stepping stone to ultimate success by awarding us the opportunity to seek our real identities and to relinquish our misconceived identities. 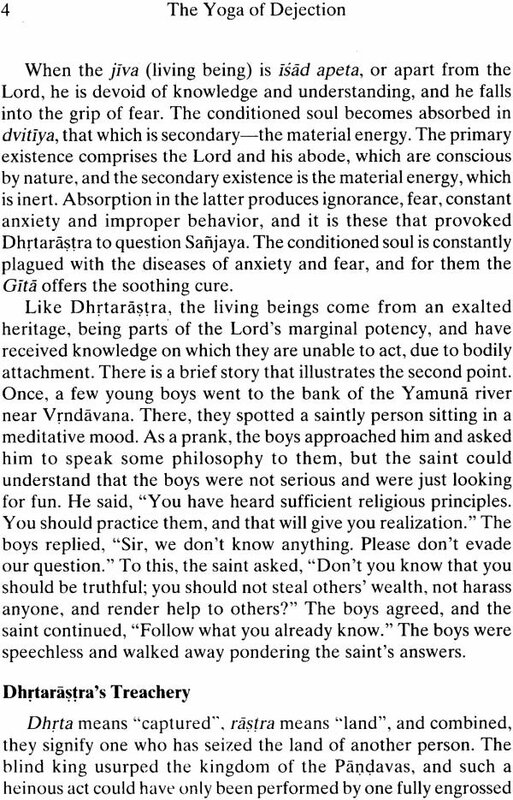 The Bhagavad-gita shows how this may come about by treating dejection as a form of yoga. Yoga here means discovery of the true self and its communion with the Absolute. 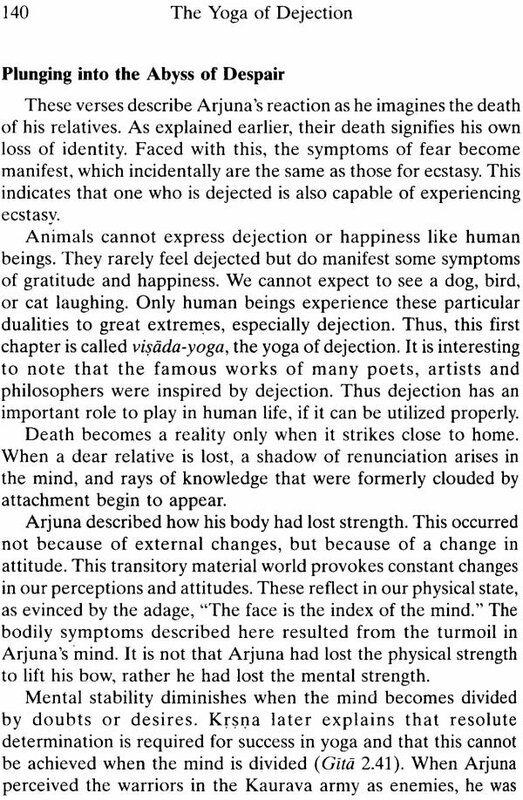 In this sense, dejection can transport us beyond identity crisis and situate us in a determined awareness of our higher purpose in life. 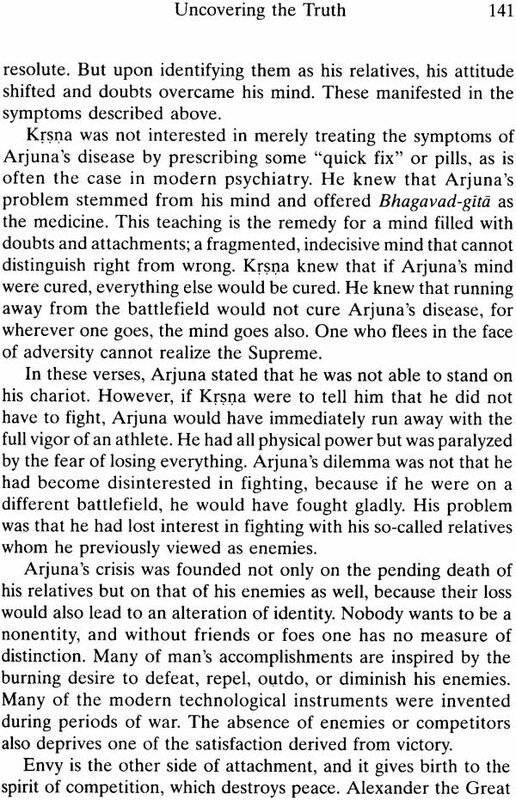 The setting for this discussion is a battlefield, where Arjuna must fact his most deep-rooted attachments. By descending to the depths of his being through the vehicle of Krsna's divine guidance, Arjuna will emerge victorious, as a warrior for truth. We are invited herein to do the same, by embarking on this journey that reflects the battlefield of life. Satya Narayana Dasa, earned his graduate degrees in engineering from IIT Delhi and worked as software engineer in USA for a few years. He gave up his field and took to philosophy. He studied the Sanskrit, six systems of Indian Philosophies under various traditional Gurus in Vrindavana. He studied the whole range of Gaudia Vaisnava literature from his Guru, Vaisnava literature from his Guru, Sri Haridas Sastri, one of the eminent scholars and saints of India. Satya Narayana Dasa founded Jiva to promote Vedic culture, Philosophy and Ayurveda through education. He regularly gives classes on Gaudia Vaisnava literature, and has authored many books on the subject. He has contributed to the twenty five volume work brought out by the project of history of Indian science, philosophy and culture. The light it sees it thinks its own. The flower toils through the night. And introduces it to day. Bhagavad-gita, arguably the most concise and systematic book of religion, ethics, philosophy and metaphysics ever written, is itself but a single part of the Mahabharata, an astonishing tapestry of ancient Vedic history and philosophy told through the lives of several generations of the great Kuru Dynasty. Bhagavad-gita is a discourse between Sri Krsna and his disciple, the warrior Arjuna, shortly before Arjuna fought a great war on the Battlefield of Kuruksetra. Because the Gita was not written as an independent book, the characters, setting, and circumstances mentioned in it are assumed already to be familiar to the listener, by hearing the preceding episodes of the Mahabharata. 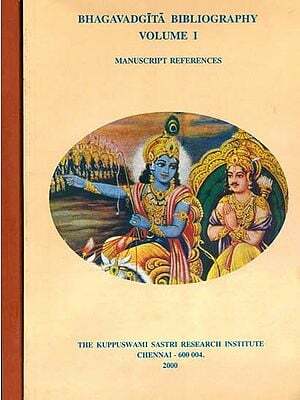 In order to satisfy the reader who wants to approach Bhagavad-gita directly, a brief and relevant summary of the events in Mahabharata which lead up to the speaking of Bhagavad-gita is given here. Currently, only a small portion of the original Mahabharata text is extant, and yet, the verses we have comprise one of the longest epic poems in history. This vast work was composed by Vyasa, whose full name is Krsna Dvaipayana Vyasa. He received the title Vyasa, or "compiler," because he compiled the four Vedas. He also wrote the eighteen Puranas and the Vedanta-Sutra. The word "Mahabharata" literally means, "of great weight." According to the author, the work is named Mahabharata because it is very deep in meaning. It is more important than the Vedas, and it contains transcendental knowledge about the Absolute Person, . Sri Krsna, and his activities and potencies. Long ago, in present-day India, there ruled a righteous king named Bharata, who was so glorious that India itself became known as Bharata, after him. Thus, in Sanskrit, Mahabharata also means "the great history of Bharata" or India, as the book describes the history of the kings who appeared in the dynasty of King Bharata. Among the kings who appeared in this dynasty was King Kuru, whose descendents are known as Kauravas. About fifty-three centuries ago, a king named Santanu appeared in the Kaurava Dynasty. His capital was at Hastinapura, near the modern city of Meerut in Uttara Pradesh. Santanu's first wife, Ganga, gave birth to a son, Bhisma. Later in his life, King Santanu fell in love with Satyavati, the foster-daughter of a fisherman. He wanted to marry her and asked her father for her hand. The father said that King Santanu could marry his daughter on one condition: that her own son, yet to be born, would become heir to the kingdom, and not Prince Bhisma, who, according to Hindu custom, was the rightful heir by virtue of being first-born. King Santanu refused to accept the condition, thinking it unjust to his son. When Bhisma came to know of this, he stood in front of the fisherman and vowed, "I will never accept the throne." But the fisherman was apprehensive, fearing that a future son of Bhisma might steal the throne from Satyavatr's future grandson. Understanding the fisherman's hesitation, Bhisma proclaimed another vow, "I shall remain a lifelong celibate." Being satisfied with Bhisma's words, the fisherman married his daughter, Satyavati, to King Santanu. Hearing of his son's noble and selfless deed, King Santanu blessed Bhisma, granting him the boon that he would never die-except by his own will. Amba already desired to marry another king, Salva, and when she revealed this to Bhisma and Vicitravirya, they freed her to go to him. Salva, however, refused to marry her. She returned to Bhisma and proposed that he should marry her, because she did not wish to marry Vicitravirya. But, as was mentioned earlier, Bhisrna had vowed never to marry, and thus flatly refused. Amba then approached the sage Parasurama, who was a renowned warrior and Bhisma's martial arts guru, asking him to convince Bhisma to marry her. Parasurama ordered Bhisma to marry Amba, but Bhisma did not heed his order. Enraged, Parasurama challenged Bhisma to a duel and they fought for twenty-seven days, but neither could defeat the other. Finally, the celestial gods had to come down from heaven and request the pair to cease fighting. Frustrated, Arriba vowed revenge against Bhisma. She retired to the forest and performed severe penance to please Lord Siva. Lord Siva, satisfied with her austerities, granted her the boon that in her next life she would be born to King Drupada as a daughter, but at the prime of her youth she would turn into a male. Lord Siva's words came true, and in her next life Amba became the warrior, Sikhandi. Ambika and Ambalika, the other two sisters of Amba, married King Vicitravirya, but he died of tuberculosis before fathering any children. 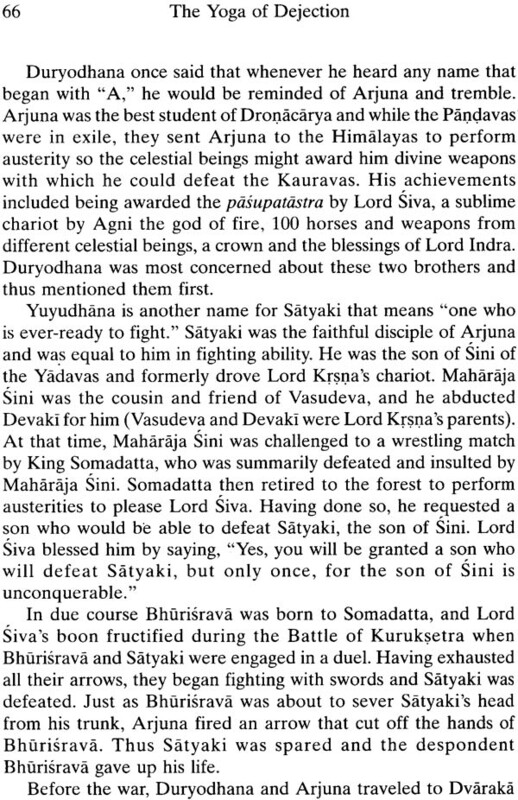 Later on, at the request of Satyavati, the learned Vyasa sired one son from each of the two wives of King Vicitravirya, in order to provide rulers in Vicitravirya's line of succession. Ambika, the senior queen, gave birth to Dhrtarastra, but he was born blind, and was thus disqualified from occupying the throne. Ambalika gave birth to Pandu, whose sons later came to be known as the Pandavas. Vidura, a third son of Vyasa, was born of a maidservant after the births of Dhrtarastra and Pandu. The blind Dhrtarastra married Gandhari, the daughter of the King of Gandhara, an area in present-day Afghanistan. She gave birth to one hundred sons and a daughter. Duryodhana was her eldest son. Pandu married Kunti and Madri. Kunti was Krsna's aunt, but had been adopted by King Kuntibhoja, a friend of Krsna's grandfather. Kunti gave birth to Yudhisthira, Bhima and Arjuna, and Madri to Nakula and Sahadeva. Although the sons of both Dhrtarastra and Pandu were all descendents of King Kuru, the epithet of "Kaurava" was popularly applied only to the sons of Dhrtarastra. Pandu was cursed by a sage, and both he and Madri died while living in the forest. After Pandu's death, Dhrtarastra occupied the throne despite his blindness. Although he seemingly welcomed Kunti and the five fatherless Pandava boys into his kingdom, he and his sons always feared and hated them, wanting nothing but to get rid of them. This loathing did not go unnoticed by Kunti or her sons. From their childhood, the hundred sons of Dhrtarastra and the five Pandavas were rivals. Among the Pandavas, Bhima was immensely strong and mischievous. He used to single-handedly wrestle all one hundred Kauravas during their play. 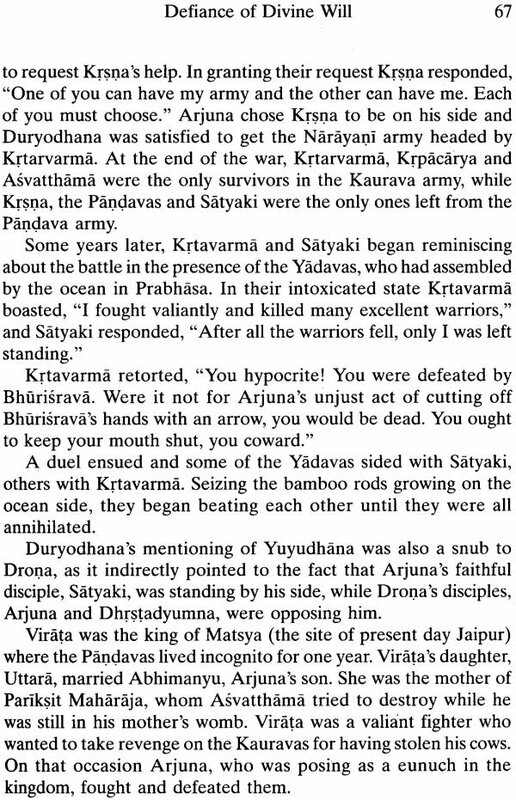 Because of this, Duryodhana became very envious of him and wanted to obliterate him. Duryodhana tried to poison Bhima twice, drowned him in the Ganges and exposed him to poisonous snakes, but Bhima survived all of these attempts on his life. As young princes, the Kauravas and Pandavas were trained in martial arts by Krpacarya, Krpacarya and his sister, Krpi, had been reared by King Santanu, who found them in a forest where they had been abandoned by their father. Krpi's husband, Drona (also known as Dronacarya), was a great warrior, expert in all forms of martial arts. The Bhagavad-gita is one of the most popular scriptures in the world. Traditionally, it is regarded as one of three main Vedic scriptures comprising the prasthana-traya, or the three royal paths leading to the ultimate goal of life. 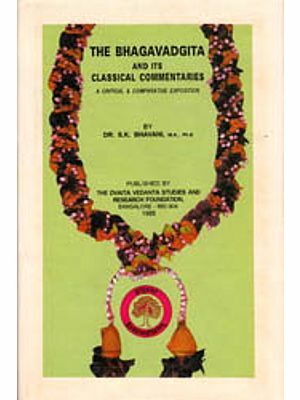 The importance of the prasthana-traya in Vedic philosophy can be discerned from the fact that almost all prominent Vedic teachers have traditionally written an expository commentary on the prasthana-traya to propound their individual schools of philosophy. Unless the philosophical conclusions of their schools could be established from these three books, the scholarly community would reject them. Besides the Bhagavad-gita, the other two scriptures in the prasthana-traya are the books of the Upanisads and the Brahma- sutra (also known as the Vedanta-sutra. The Upanisads are a body of literature that explains the essence of the Vedas. The Brahma- sutra, written by Vyasa, is a synopsis of the Upanisads, synthesizing their meaning-whenever there is a seeming conflict between Upanisadic statements, one can resolve it with the help of the Brahma-sutra. But being sutras, or aphorisms, the texts of the Brahma-sutra are extremely terse (sometimes only a word or two) and cannot be understood without the help of a commentary. The Gita, which also gives the essence of the Upanisads, helps to unfold the meaning of the Brahma-sutra. Succinctly and clearly, it portrays the underlying principles of the Upanisads and the Brahma-sutra. 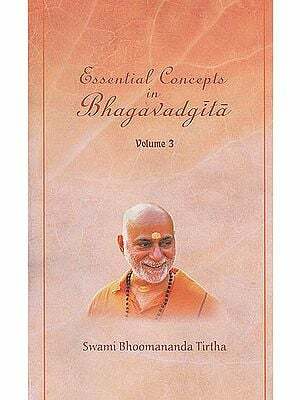 Among the three scriptures of the prasthana-traya, the Bhagavad-gita is the one most widely read, because of its lucidity and practical approach. Even an ordinary person without a background in philosophy or theology can grasp its message and apply it in daily life. The message of the Gita is universal-not limited to a particular class of people. It delineates absolute truth and teaches the art of living, by which one can obtain ultimate happiness and the supreme goal of human life. Truth, like the laws of science, is never sectarian. Just as the law of gravity is not restricted to a particular nation or religious denomination, the Gita is not intended only for Indians or Hindus-it is meant for anyone who wants to be happy. It does not discriminate on the basis of nationality, gender or creed. It does not demand superficial changes in dress, appearance or profession, but instead recommends internal change. By following the principles of this book, one will automatically excel in one's field of action, because the Gita teaches us how to optimize our abilities and realize our full potential. The Gita promises this because it specifically cures the disease of dejection that stunts one's physical, mental and spiritual growth. 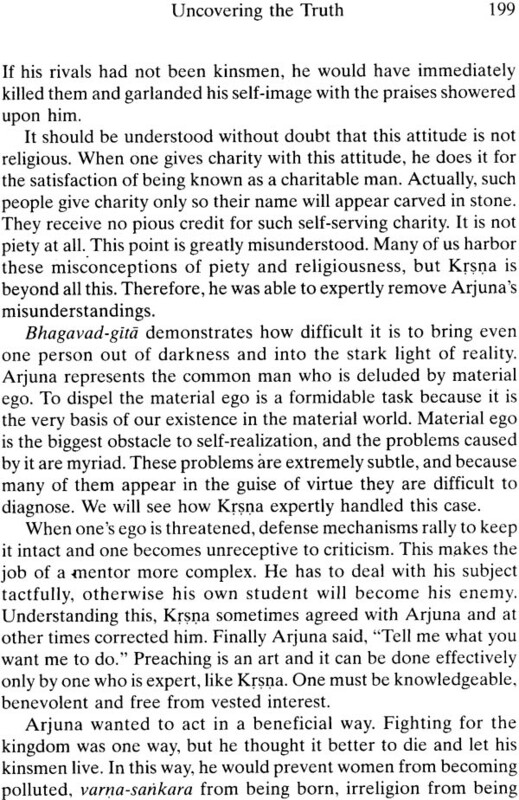 It is this that sets Bhagavad-gita apart from the often well- meaning, yet failed attempts of various theorists to provide a clear solution to the problems of the human condition. Being trapped within the forest of material life, one tends to become either lost in the details of existence here, or fragmented and overwhelmed by its relative immensity. Thus, when an ordinary person goes out and actually searches for answers to his questions about life, he seems to find only one of two things. He may encounter hundreds of books of philosophy that are just like a muddy pond-dark, confusing, and such that if one should accidentally fall into it, his only thought is to get out, take a shower and never return. On the other hand, he may come upon thousands of "self-help" books, filled with overgeneralizations, platitudes and clever words that only tell people the things about themselves they want to hear. Such books do people a disservice by inflating their egos and giving them the feeling that they have been relieved of their miseries, when in fact they have not. Such words can be compared to a person's shimmering reflection on the surface of a body of water. Seeing only a glorified image of himself, a viewer becomes so distracted and preoccupied trying to grasp at its substanceless form, he completely forgets the reason he came to the water in the first place, which was to drink and end his thirst. Because the Gita emanated from the mouth of the Lord, it does not have any of these defects. There are no "secret levels" one has to buy his way into with a credit card. It is like the crystal clear water surrounding a coral reef: when one looks into it, he sees directly to the bottom-the answers are clear and lucid. Then, upon entering the water, he feels refreshed and is amazed at its depth, expansiveness and beauty. It is free to all, and everyone is invited to enter into it as often as they like and take as much from. it as they desire. One might still object, saying that the Gita is meant only for Hindus in India, because it was spoken by a Hindu god. This, however, is a misconception-Krsna is not a god only for Hindus any more than Christ is a teacher only for Christians, or Mohammed a prophet only for Muslims. These limiting designations were assigned to them after the fact, but in reality, none of these teachers restricted their message to a particular section of society, because what they profess is absolute, not relative. Krsna makes this point in the Gita (9.32), saying that any person can become perfect by following his instructions. Thus, true religion, like truth itself, is universal, and it is only apparent followers that invent factions and create ill feelings between sects- often to facilitate some personal agenda of their own. Unscrupulous persons twist the words of scripture to arouse fanaticism among the innocent and then manipulate them with fear.